Brooke Burton discovered Dennis, a 6-year-old miniature dachshund, in 2013. 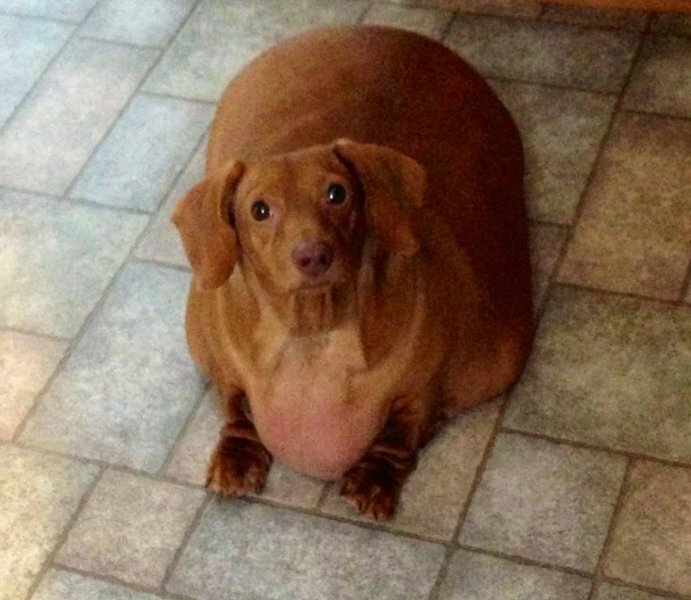 Dennis had been in the care of Burton's relative, who had been over-feeding the dog with an extremely unhealthy mix of human foods, leaving Dennis at a shocking 56 pounds. He could barely walk. After being put a strict diet, Dennis lost a lot of weight, but this left him with an abundance of excess skin. Burton took him to The Ohio State University Veterinary Medical Center in December 2013, where he received his first skin-resection surgery, which was performed by Dr. Kathleen Ham. Dennis has had two more of these surgeries since, with the last being in February, and he now weighs a healthy 12 pounds. Burton has decided to set up a fund through Ohio State called "Dennis' Legacy," to help raise awareness for pet obsesity and provide care at a reduced cost for pet owners whose animals meet the criteria. The fund has just launched, and will hopefully be able to ease costs in the future for recommended food, rehabilitation and exercise therapy and consultations with a veterinary nutritionist. Checks can also be mailed to Development, 1900 Coffey Road, Columbus, OH, 43210, payable to The Ohio State University Foundation with "315098" in the memo line. The Columbus Dispatch - "Once-obese dog loses 75 percent of his body weight"
People magazine - "How Dennis the Dachshund Shed 43 Pounds"
ABC 6 - "Once Obese Dachshund Physically Transforms"
USA Today - "Dachshund goes from obese to 12 pounds"
Huffington Post - "Dennis The Dachshund Loses 44 Pounds, Doesn't Eat Burgers And Pizza Anymore"
NBC Today Show - "Dachshund on a diet: Obese pup loses 80 percent of body weight"